Ancheer specialise in a range of electrical and non electrical products, from simple trampolines to some high tech electric mountain bikes. All their products follow a theme of being reasonably well made and being on the lower end of the price range. 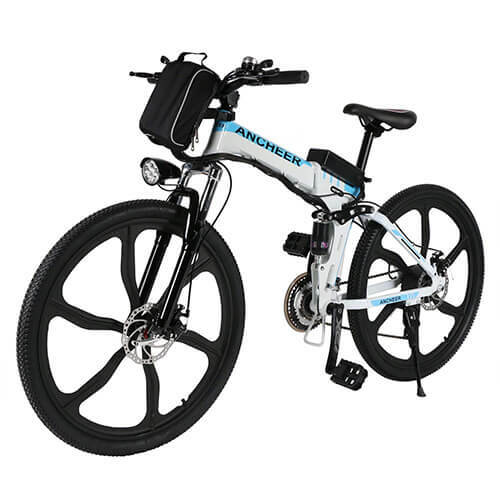 Today we’ll look at and review the Ancheer Folding Electric Mountain bike. 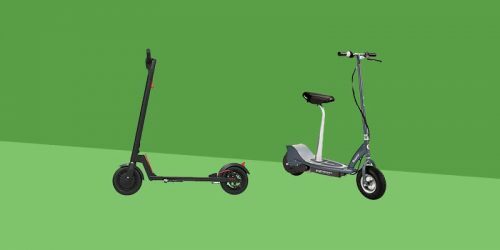 We’ve gathered all the information you need to help you decide whether it’s the right e-bike for you. 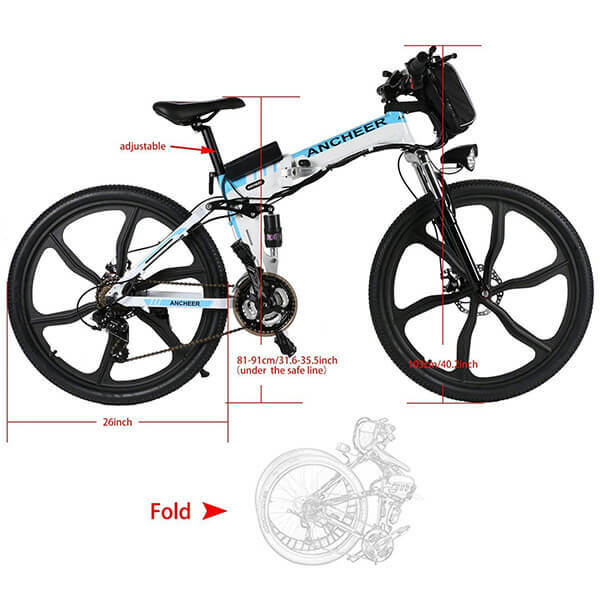 The Ancheer Folding Electric Bike is a great product at a great price. It’s pretty good looking, despite the slightly cumbersome battery pack attached to the frame. It has a wide range of features, is very easy to use and comes mostly assembled. The ability to fold it down for easy transport and storage just adds to the versatility and practicality that the bike already has. Ancheer are also said to have a great customer service team if there are any problems. Best of all you get all of this for way less than a $1000. 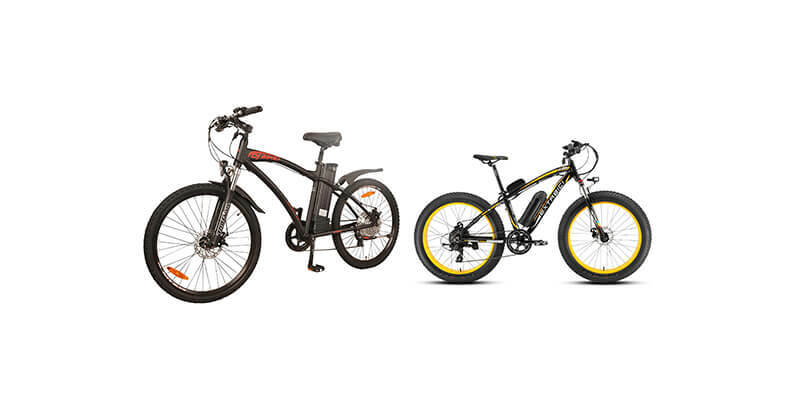 Most quality e-bikes now a days will easily set you back $1000, sometimes several times more. Starting with the frame and the folding and locking mechanism. The frame is made from and industry standard aluminum alloy that makes it strong yet light. Obviously it has a folding mechanism that uses a simple, quick latch and lock to hold it in place. This is very good, it feels sturdy when the bike is extended and can pretty quickly fold down to be stored. The pedals are also made from the same aluminum alloy as the rest of the frame. The whole frame is also covered with an anti rust and anti exposure paint to help keep the finish on the bike after it’s been exposed to the elements for a while. The folding mechanism helped the Ancheer achieve a place on our list of the best folding electric bikes. 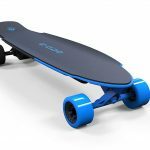 The wheels are 26 inch magnesium alloy wheels that have an anti-slip resistance tire. This allows the entire system to be suitable for any weather including rain and even snow. The tires are are high quality lithium tire. The Ancheer is powered by a 36V 8Ah battery system that is mounted on the front of the handlebars. This powers a 250 W brushless motor. 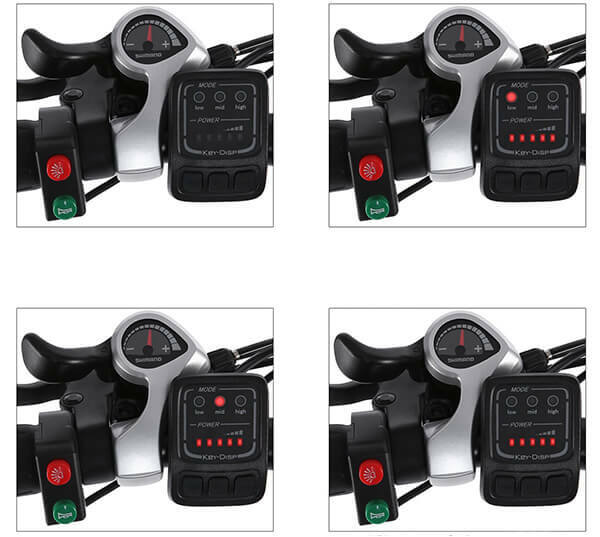 How much power you want the bike to exert is dependant on which mode you set it to. 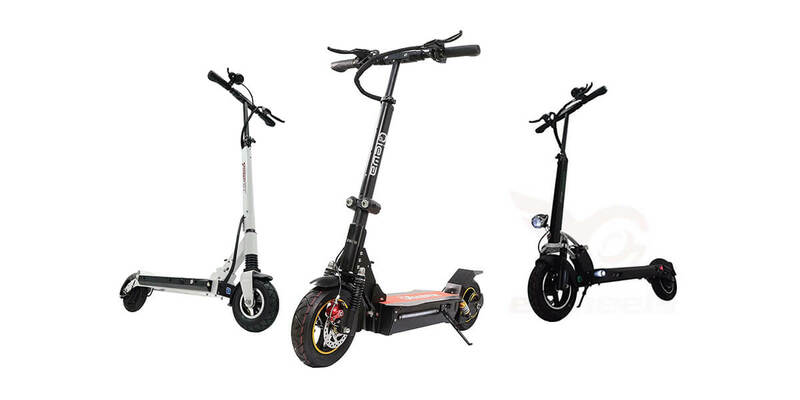 It has 2 modes: assistive and e-bike. E-bike will power the entire thing for you so you don’t have to pedal at all, whereas assistive will give you a bit of power to help you out. This is all controlled by a small panel on the handlebars. The assistive mode has 3 settings so you can have as much control over the amount of work you do as you desire. The bike comes with front and rear suspension. 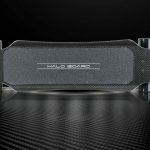 The front is made from a set of high strength carbon steel shock absorbers and the back is made of a single shock absorber situated under the seat. These work well and give a surprisingly comfortable ride. It has a front and rear mechanical disc brake system and a 21 speed Shimano gear transmission system. We think that the Ancheer Folding Electric Mountain Bike looks (mostly) great. The frame is finished very well and the wheel are striking. The only complaint we have with the looks and the overall design is how they decided to implement the battery pack. The little pouch at the front looks out of place and can feel a bit cumbersome. We would have liked if they could have potentially attached it, or better yet integrated it into the horizontal part of the main frame. I understand the difficulties of doing this as the bike has the folding mechanism but it would have been nice if they’d have managed it. The build quality, however, is generally fantastic. 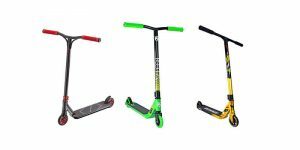 It feels sturdy and strong, the clip to hold the fold in place never feels like it’s coming loose and the wheels feel like they can conquer anything. 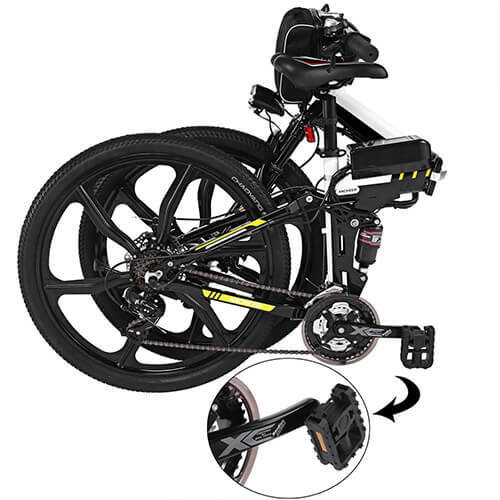 Also the suspension system is quite impressive and isn’t even included on the non-folding Ancheer Electric Mountain Bike. This suspension system and the strong frame help give the Ancheer the ability to comfortably hold riders who weigh up to 150kg (330 lbs). The Ancheer control system is also fairly simple and intuitive to use with decent instructions if you can’t figure it out yourself. The 250 W motor may seem a little on the small side but it’s quite capable. 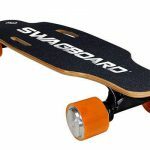 It gives a top speed of almost 16 mph without any form of pedalling. The acceleration is decent, aided by the low weight of the bike. However, it can’t really compete with bikes that have 500 W or higher motors. These do tend to cost more than the $1000 mark though. The battery is said to give it about 30 miles maximum range when in assistive mode. The battery is able to fully charge in 4-6 hours. The performance is good for what it is. If you’re looking for one of the fastest e-bikes on the market, this isn’t it. The top speed and range are both good for the components used and the bike has no problem going up hills. So it is a great electric bike for what you’re paying. As a mountain bike it’s also pretty good. There are better out there and dedicated mountain bikes of the same price will be better almost every time. But that’s not why you’re buying this. The general performance can be summarised by saying it is good for what it is in all aspects. 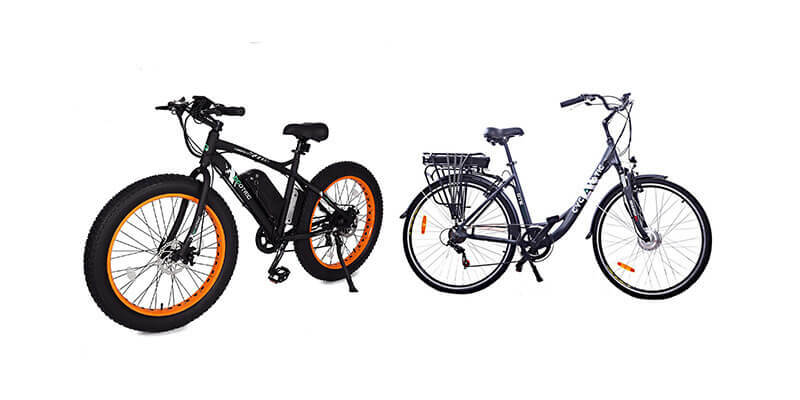 One of the best value for money electric bikes on the market – The build quality and performance of this standard would usually warrant a price tag of almost double what Ancheer are asking. 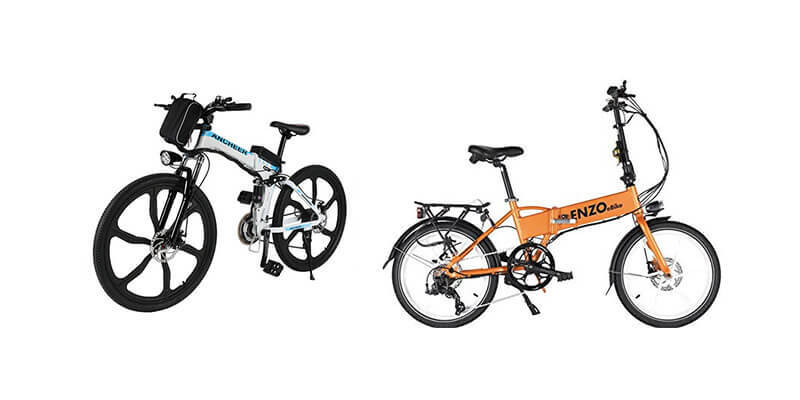 For this reason we included it on our list of the 10 best electric bikes for less than $1000. Click the link to see what position it came in. Very versatile – It works just as well on the road as it does off of it and having the ability to fold it down means that it could be used as a commuting bike just as easily as it could be used as an adventuring bike. 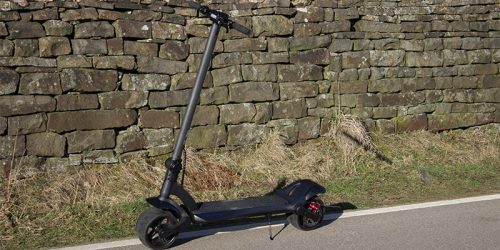 Well made – The overall build quality of the e-bike is fantastic. It combines good materials and good manufacturing to produce a strong and sturdy bike that can tackle any terrain and environment. 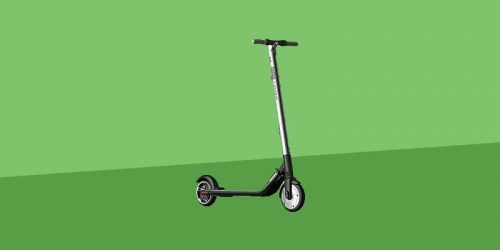 Acceleration could be better – This is being a little bit picky but we feel like they could have added the the 300 W motor from the standard Ancheer mountain bike just to give it that little bit more. Battery pack – The battery pack itself is absolutely fine and provides enough energy for most trips. The problem is the placement. We feel like it would be better lower down and more towards the center of the bike. This certainly isn’t a deal breaker but it is a little inconvenience we’ve learn to live with. 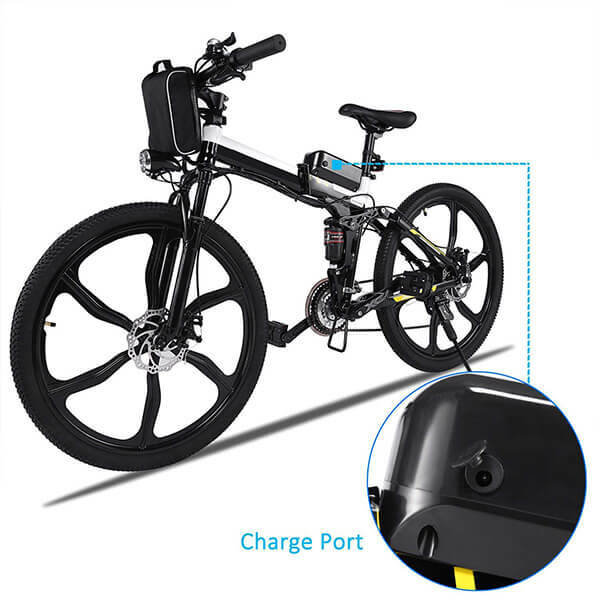 Overall, you’re not going to get a foldable electric mountain bike that’s better than this at the price that Ancheer are selling it for. It’s well built and designed, it’s easy to use and put together and it makes mountain biking so much more fun whilst opening it up to more people. If you’re looking for a versatile e-bike that is just at home on the mountain as it is on the morning commute, all for waaay less than $1000 then this might just be the bike for you.